Employees are our most valuable assest. 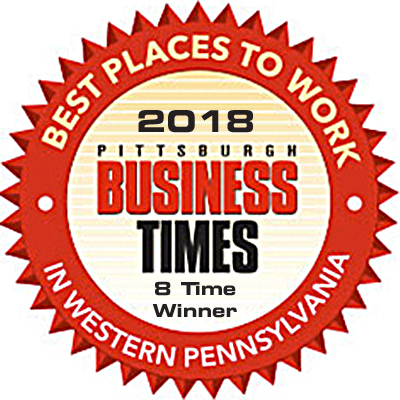 We are proud to be awarded “Best Places to Work” 8 times. Here are a few excerpts from our most recent employee feedback survey. "As an engineer coming from a large company, I find myself as an integral and meaningful part of a smaller, more dynamic collection. I'm able to be intimately involved in designing, manufacturing, and testing the solutions that we create, and my co-workers help me understand and overcome the challenges that eventually help me grow as a technical lead. I'm grateful for the support from middle management in my own career goals, as they readily set aside time to foster my personal growth both as a professional and as a technical expert, and upper-management supports this growth through clear and fair incentives that reward my extra work." "The company offers a diverse portfolio of products and services that would benefit virtually any client from any industry. The leadership team proves everyday that they care about each and every customer, and approach every decision with not only their customer's success / satisfaction in mind, but how it impacts the business and the employees. Simpy put, this company cares!" "Everyday is a challenging and rewarding opportunity to learn and grow. The company encourages growth and the teams pull together to support one another to make sure the quality of the work is superior. For an Engineer, this is a TRUE R&D environment. It's very exciting and enjoyable to work with new technologies for innovative applications." "It is clear the company values the operational team and gives us a large pool of amenities to give us comfort throughout the work day. The team prioritizes education and best practices to develop the newest engineers. Consistently practices a "Lessons Learned" style of work." "The company has a good management team. They are committed to continuing to grow a successful business. There is also an appreciation for the employees who work here and it is demonstrated in many different ways." Data Science Automation is an award-winning, fast-growth, technology consulting and systems engineering firm. We provide our regional, national and international clients with best-of-breed laboratory, test and industrial automation solutions applied to diverse industries and government agencies. Our clients often comment favorably about our people, personalities, process and performance. Why work for one company in one industry, when you can have the best of all worlds. Work at DSA on projects for an extensive client base including a who’s who in their respective industries: GE, ExxonMobil, National Instruments, US Govt Agencies, GlaxoSmithKline, Alcoa, Northrop Grumman, Mack Trucks, General Dynamics, Boeing, Lockheed Martin, Novartis, Philips, Siemens, Medrad, etc. By its nature, the business of Data Science Automation is difficult; we are outsiders — guns for hire — that must demonstrate constant value, juggling multiple clients, while occasionally under intense scrutiny to perform under adverse conditions. If you offer exceptional, relevant skills, and prefer employment with a stable and revered company, DSA offers unprecedented growth & learning potential with diverse assignments at hundreds of the best client companies. As a small business providing complex services to the most demanding clients, we are extremely selective in our recruiting practices. We offer diverse, challenging, rewarding and collaborative experiences to talented team players that can handle the daily responsibility of having a direct and measurable impact on a company’s performance. Candidates should be prepared to endure an extended and thorough recruiting process based on advanced Topgrading principles. We require all of our A-Players to contribute clearly & openly in a flexible work environment, to grow professionally given measured accountability, and to perform assigned duties masterfully with an organization based on integrity and managed for growth. Candidates must be hardworking, self-starting, confident, and highly motivated. They must have the demonstrated ability to thrive in a dynamic environment offering diverse industry exposure & extreme project variety, and to assume broad responsibilities and overcome significant technical challenges. Thank you for your interest in our company and the great work we do. We sincerely appreciate you taking the time to learn about the opportunities available with us.